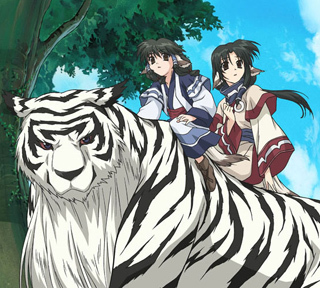 Utawarerumono, Utawarerumono, Utawarerumono. Just the title alone makes you go, "What the...? My tongue is supposed to do what?" But in defense of Funimation, it sounds WAY cooler than "Him Whose Song is Sung" or "Songs of a Legend". 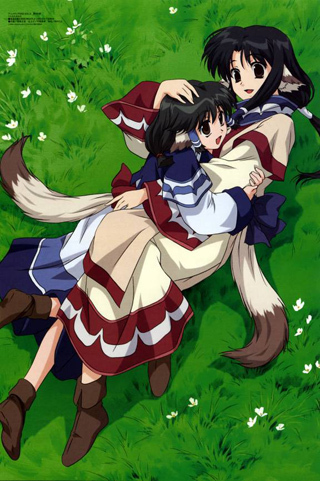 To be honest, anyone would skip over Utawarerumono if they judged it by its cover. 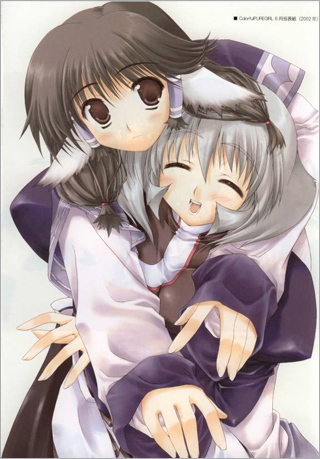 The cover is not spectacular, you can't tell who the main character is, and most importantly, what kind of story is it? This is where Anime.com and I come in; we'll tell you exactly why you should NOT skip over this DVD. Haven't we repeated "Don't judge a book by its cover" to death yet? Nope, not quite because here comes another series that we'll go on about why you should check it out. 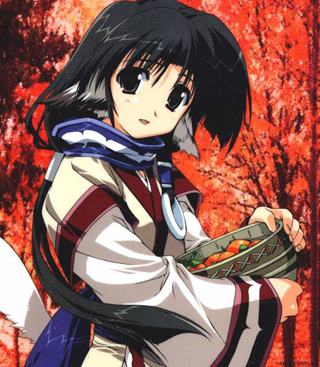 Our main character is amnesiac Hakuoro, left for dead out in a remote forest. 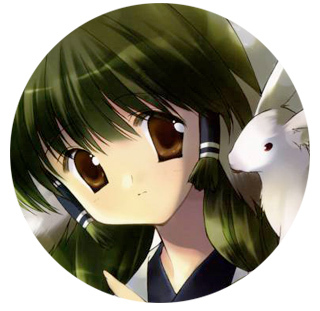 Luckily for him, Eluluu, a young healer apprentice, bravely brings him home so that her Grandmother, Tsukuru, and she can take care of him. 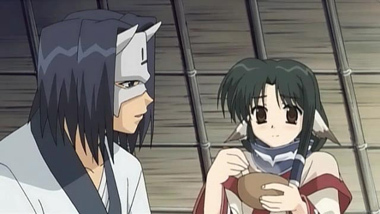 Utawarerumono definitely starts with a bang; you're not even 5 minutes in and you see Hakuoro's "Man in an Iron Mask", only he can't remove it like Leonardo can. The ensemble cast begins immediately. Eluluu has a younger sister, Aruruu, cute as pie and stubborn as a mule! With her comes Mukkuru, an orphaned baby white tiger that grew at a surprisingly fast rate. 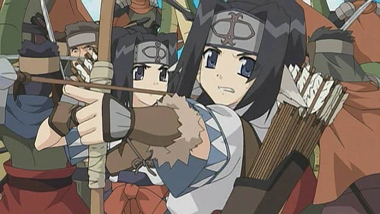 Tsukuru brings Oboro, chief of a village of bandits near Eluluu's simple farming village, to the mixture as well as his sister, Yuzuha, who she is healing, and Dori and Gura, archer twins who are constantly by Oboro's side. 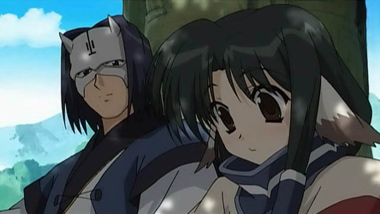 A civil war breaks out because Oboro and his band decided to become Robin Hood and his Merry Men to steal food and supplies from the closest government fort near them. 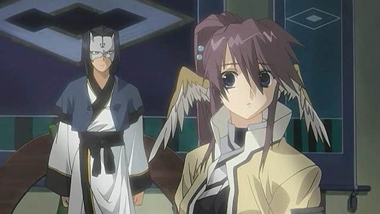 Tsukuru dies from trying to protect Aruruu when the government comes looking for a scapegoat and Hakuoro steps up the plate to lead the rebellion. The government sends in their best men, Benawi and Kouro, but the power of the people is too great and a new government is born, named after their martyr, Tsukuru. 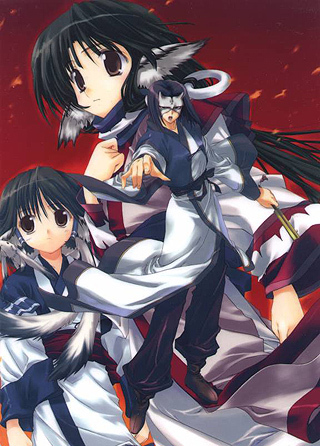 Hakuoro convinces Benawi and Kouro to serve their country instead of governments that rise and fall. No seppuku or rest for them because other nations, seeing how weak the new government is and how busy they are with rebuilding, decide that now is a great time to expand their territories with Tsukuru's territory. 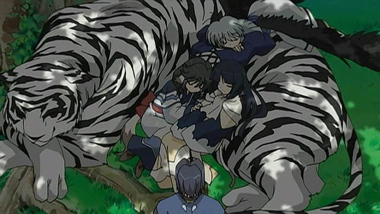 Nations fall as one after another test the ingenuity of Hakuoro's strategies and the loyalty, strength, and plain old stubbornness of his people. Just as Benawi and Kouro ended up swearing their loyalty to Hakuoro and their country, Touka, Karura, and Urutori finally join this ensemble cast. 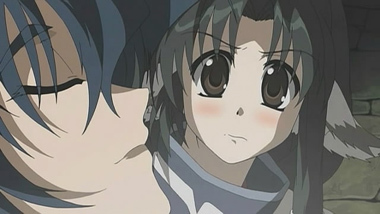 Last but not least, Camus joins in as well; she is Urutori's kid sister but in the end, she is as pivotal to fate of the world as Hakuoro is. Now that we have the characters out of the way (I'm not going to go into detail with them because literally, there is something for everyone with such a huge ensemble cast), we can start on the praising. Everyone has compared Uta (sorry my fingers are getting tired just typing all those letters) to The Twelve Kingdoms and yes, they are very similar BUT Uta never has a side story that things slow down in. Think of The Twelve Kingdoms as a run on a treadmill over a month's time: you will jump on, warm up a bit, run for your life, cool down, stop running, continue with your life, and repeat. Uta is like running in a marathon: you warm up, jump in there with a light jog because you know you have a few hours to go, pick up the pace a little, slow back to a light jog (you can't stop; keep forging ahead) if you need a breather, repeat until you see that finish line and then run like the devil is on your heels to grab that golden ring! The Twelve Kingdoms: you are in a gym either by yourself or with sweaty stinky strangers. Uta: a core ensemble cast that you are constantly training and growing with, days and years before the marathon even hits so you know, if all of a sudden you hit that brick wall in the middle of your run, they are there to help you smash though it. The Twelve Kingdoms: a higher entity chose your life on the treadmill for you (God? DNA? MTV? HBO?) and even designated a trainer to you too. Uta: Chose your path, grow some balls to stick to that path, and you'll earn the friends and have the family that you deserve and they will make sure you stick to your path as well. Uta may not be as spectacular and flashy as a lot of animes that are out there right now; there isn't a constant barrage of wow factors bombarding you but you will meet amazing characters that resonate with you that won't be pushed out by the next fancy eye-candy that comes your way. Who needs the $250,000 Ferrari that will die the minute you hit a decent size speed bump when your $30,000 Prius brings you, your family, and your friends to and fro anywhere and everywhere safely and comfortably? 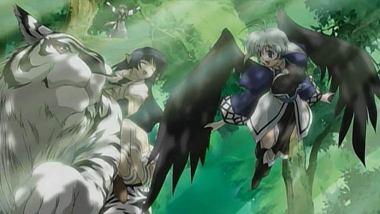 Below: The opening titles from Utawarerumono.